There will probably be flashing – but don’t worry, it’ll be LEDs rather than Andrew himself. The next meeting of the RISC OS User Group of London – ROUGOL – will take place two weeks today, on 21st May, and the guest speaker will be Andrew Conroy. 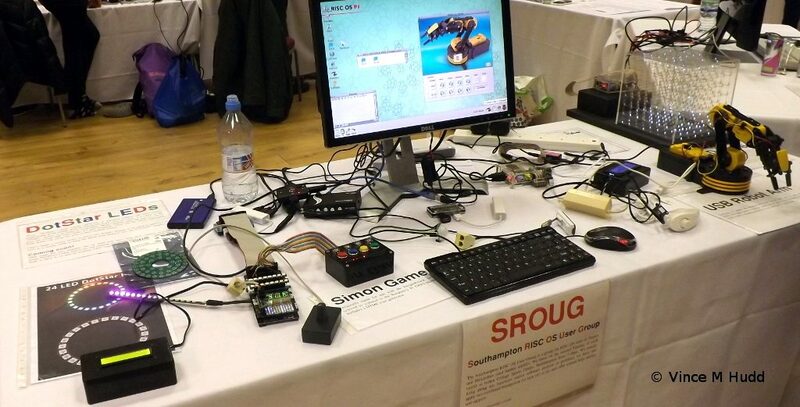 Although Andrew will be recognised by many people as one of the faces of CJE Micro’s, regularly in attendance as one of the team at RISC OS shows, he also uses RISC OS in his spare time – and his talk in London will centre around one aspect of that: Raspberry Pi interfacing projects, for which he uses BBC BASIC. Visitors to this year’s Southwest Show, as well as those who didn’t attend but have read the RISCOSitory show report – which is precisely none of you, because I only started writing it a couple of days ago – will know that due to Chris Evans being otherwise occupied with work being done on his new house, the little shop with a lot of stock was not present. The flip side of that particular coin, however, was that it gave Andrew Conroy an opportunity to attend in his own right, showing off his various interfacing projects. There is clearly a wide range of things visible the picture, including a LED cube, a Simon game, a ‘pHAT Stack’ board with a variety of things connected to it (more on that in the show report when it appears! ), and a robot arm – and at the left, a set of DotStar LEDs, which Andrew hadn’t made use of by the time of the show, but may very well have done by the time of the London meeting. Andrew will bring a selection of these items with him to London, and will talk about how to connect and control these devices using the Raspberry Pi’s GPIO pins and BBC BASIC. The venue serves a range of hot and cold food, as well as both alcoholic and non-alcoholic drinks, and the meeting is free for anyone to attend. It is between London Bridge and Borough tube stations – only a short walk away from either, through well-lit streets with good CCTV coverage – and there is ample cycle parking, which is also covered by CCTV. For drivers, don’t forget that the venue is in central London, so you need to take that into account when planning your journey; allow plenty of time and patience to deal with London driving and parking. If you need help finding the Blue-eyed Maid, or if you have any related queries, ROUGOL can be contacted by email, via Twitter, or by phone on 07970 211 629. As well as the next meeting, on 21st May – and the subsequent meetings, which take place on the third Monday of each month – another related date for your diaries is 27th October, 2018. That’s when this year’s London Show will take place, as ever in the St Giles Hotel, Feltham.